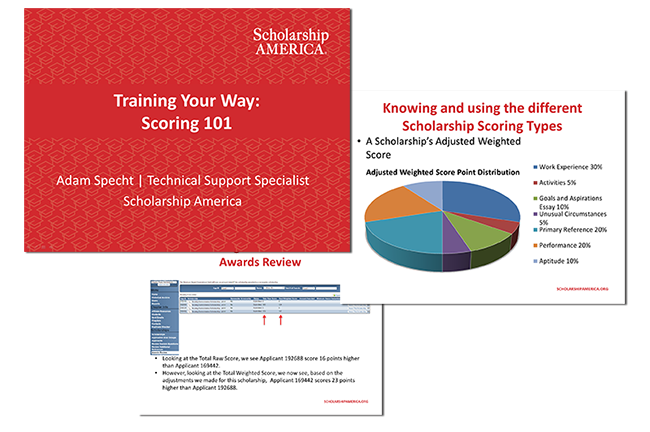 Scholarship America introduced “Training Your Way,” a series of one-hour webinars for Dollars for Scholars chapters, in fall 2016 — and the popular training series will be returning for a second season in September. “Our topics ranged from strengthening your board, to dealing with changes in the FAFSA schedule, to more technical webinars on scholarship management and assisting students with applications,” said Amy Ronnkvist, Director, Operations, for Student Success Programs at Scholarship America. Eight webinars were held from September through December, with about a third of Dollars for Scholars chapters participating. Of the 405 registrants, 41 percent participated in more than one webinar. Vivian Whitaker of Cloverdale Dollars for Scholars participated in the series as both an attendee and a presenter, hosting a session on Getting Students to Apply. The 2017 Training Your Way webinar series will start in September with sessions on building donor relationships and working with homeschooled students. Volunteers will also get training on the next round of enhancements coming to ChapterNet, the Dollars for Scholars online scholarship application platform. To expand the impact of the Training Your Way experience, Scholarship America will also launch a Sharing Your Way companion discussion that brings together a small group of affiliates who have a common interest in a particular topic. Through continued learning and sharing, Scholarship America’s nationwide network of volunteers is able to come together and focus on local students — no matter where they are.